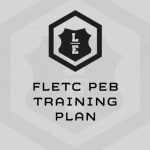 The Federal Law Enforcement Training Center (FLETC) Physical Efficiency Battery (PEB) is a one-day fitness assessment for Law Enforcement Officers beginning training in any FLETC course or training academy. We address this graded event two ways – practice the actual event 2-3x/week, and with our Toe Touch Complex exercise, which trains hamstring flexibility. We deploy an assessment and use our proven percentage-based Rat 6 progression. Athletes are assessed 3x during this plan – beginning, middle, and end. Progressions are reset after the mid-cycle progression to account for the athlete’s increase in fitness from the initial weeks of training. Similar to the Sit & Reach, we tackle training for this classic agility drill 2 ways: (1) Practice the drill – 2-3x/week and with 10-meter shuttle repeats to train drill-specific movement, strength, and work capacity. The plan also includes our Quadzilla Complex which will help train overall leg strength and the eccentric leg strength needed for the direction changes in this drill. The PEB is graded dependent on Gender and Age. CLICK HERE to view the PEB Score Chart. PEB assessment at the beginning, middle and end of the cycle. Event progressions are based on these assessment results and in this way the plan automatically “scales” to the incoming fitness of the athlete. Everyone, fit or unfit, will be pushed by this plan. Week 6 of the plan is an unload week. You’ll want to complete the plan the 6 weeks directly before your FLETC course start date. Click the “Sample Training” tab HERE to see the entire first week of programming. You are encouraged to do it before purchasing. Why are there two numbers next to an exercise? 3/5x Pull Ups means female athletes do 3x Pull Ups and males do 5x. If the session calls for 8x walking lunges, does that mean 8x walking lunges total or 8x each leg? 8x each leg, 16x total.